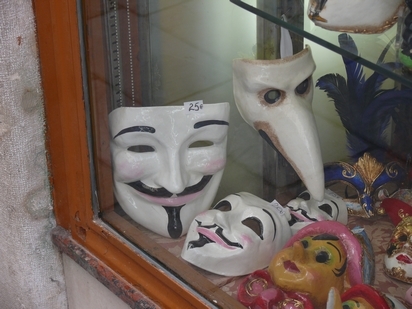 From the fact that the Venecians never abandoned the use of the Bauta until the Austrians marched in and changed politics and culture, we know that there probably never was too much misuse of the society mask to give it up. That’s a little mystery, because having the chance to act anonymously always creates temptations to act in an antisocial, egoistic way. M.E. Kabay for example, with respect to deindividuation theories, points out that the deindividuation factor of practical anonymity may foster incivility, dishonesty and a more aggressive behavior and that it may lower self-reflective propensities (see sources to find his essay). I already mentioned that one of the reasons why the Venecians only had to cope with a tolerable degree of misused anonymity was the fact that bearers of the Bauta did not escape society rules and expectations and that they could be practically unmasked if necessary. But this measure certainly only was used as a last resource. Another reason why citizens adhered to good manners when wearing the mask certainly was that when they put it on, they changed their existence to the role model of an ideal member of the noble citizenship. The role of “Signora Maschera” not only was to be characterized as generic and predefined, as I mentioned before, it also meant to reduce personal characteristics and to play up the qualities of the noble patrician as an idealized model. There are certainly parallels to old ideas of the “perfect gentleman” with his perfect style and manners. 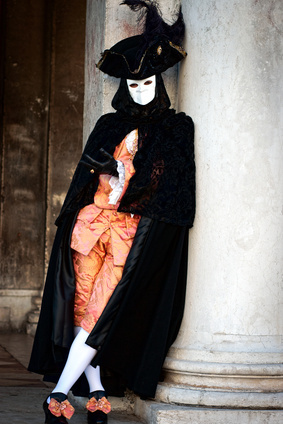 From Karbe and Toscani (see sources) we know that Venecians wearing the Bauta explicitly behaved politely and chivalrously when wearing the Bauta and that they even tried to move and communicate in a most elegant way. 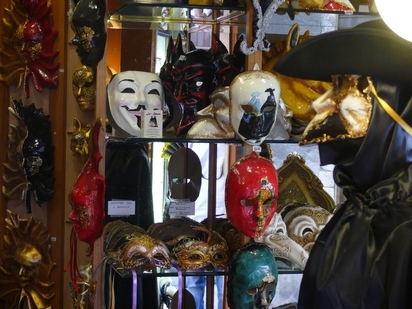 Munich business consultant and psychologist, Dirk Appel, reminded me of the fact that the English word “person” (German “Person”, Italian “Persona” and so on) is based on the Latin word “persona” which meant “mask”. Etymologically, it roots in “per sonare”, an expression for the voice of an actor sounding through a mask. From Appel’s point of view, today managers are mostly paid for playing a role. The “person” they appear to be is modeled to comply with certain expectations from the business world. It is seldom congruent with what could be called their inner self. So don’t say too easily that you never wear a mask.